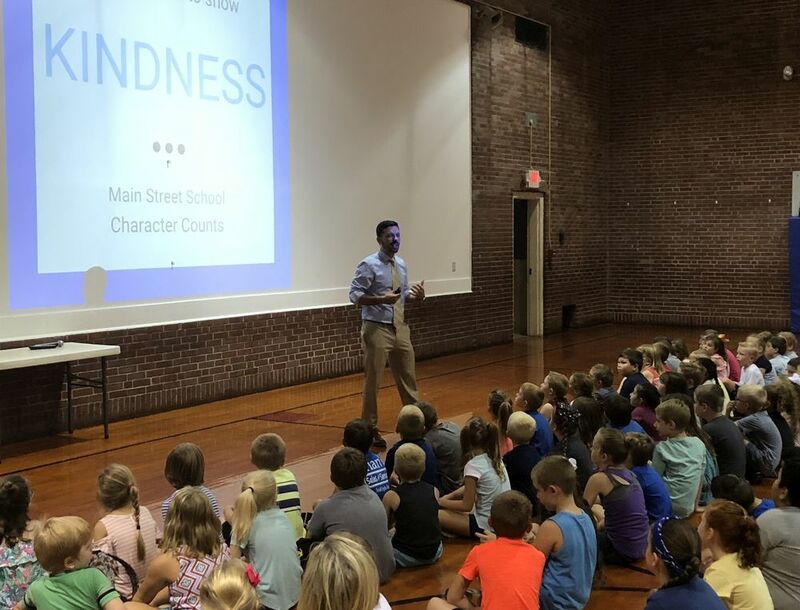 Main Street School & Kindergarten Center hyper-FOCUS on KINDNESS during September. Our school & our community need students & members that care about others & show it. Moulton Middle School Principal, Russ Tomblin, addressed Main Street students Tuesday, September 4th “kicking-off” KINDNESS value. Mr. Tomblin began w/ a short video w/out words. 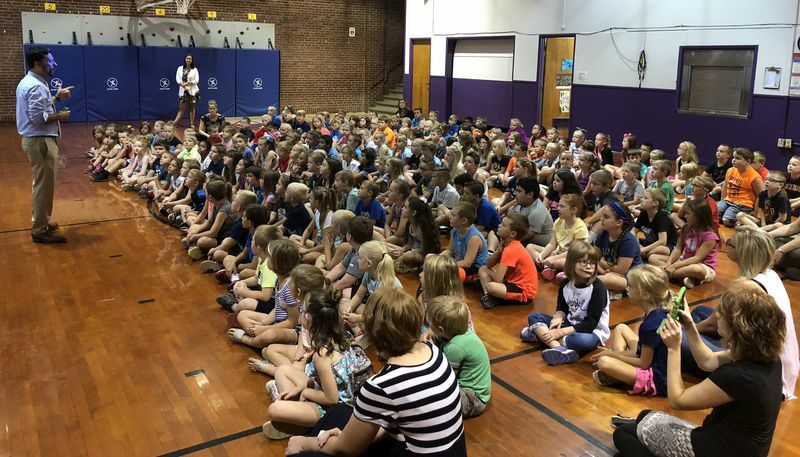 The theme was evident: Kindness “spreads.” Students analyzed the “ripple effect” & realization that Kindness does not cost money; it just cost time. A kind person notices opportunities to be kind & takes action frequently enough to become habit & associated w/ them as the “norm” of their character. 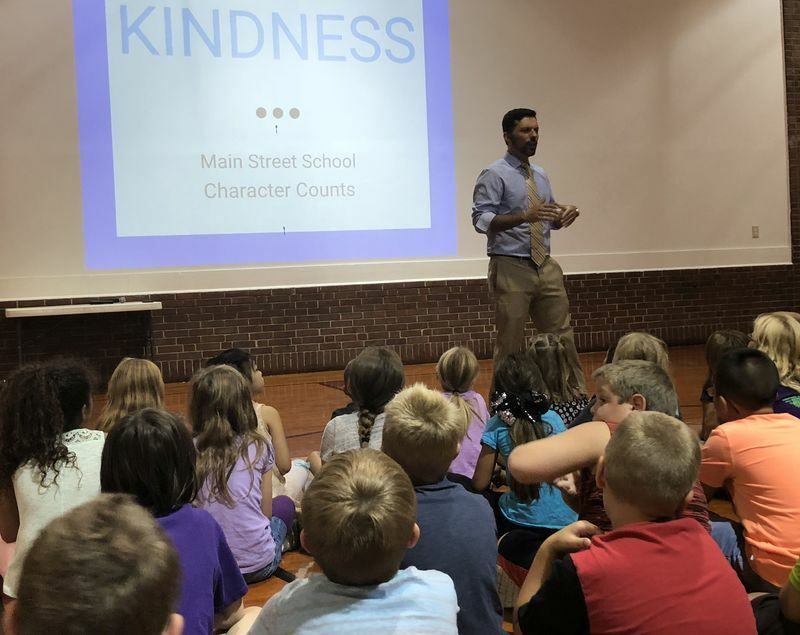 Mr. Tomblin discussed “Random Acts of KINDNESS.” Taking initiative just to show others you care. This lead into the “Kindness Challenge.” Identify one person to positively target. Do not say anything negative about that person to them or about them. Say something positive about them to them or to someone else each day. Do one act of Kindness each day. Students watched a short video regarding some neuro & physiological science. Hormones are naturally released such as endorphins & serotonin which decrease pain levels & help you relax & oxytocin which lowers blood pressure. Students “practiced” Kindness w/ a compliment & a smile to their peers on their right & then on their left. The focus w/ KINDNESS obviously has an anti-bullying message that is reinforced all year. September 2018 KINDNESS is sponsored by Yen Ching Chinese Restaurant. Our "mantra" @ Main Street School & Kindergarten Center is "BE NICE; WORK HARD."